I’m starting off the New Year with a question and a splash of color. If you asked 100 people to name the dominant primary color, what would be their answer? I reckon the color Red would be certain to come top of the list. It features so strongly, subconsciously, in everyday life. Red is the cardinal color. It’s the color that shouts and can’t be ignored. The color for Stop! Danger! Emergency. Passion and Violence. Emotion. Fire and Heat. It symbolizes power and strength. It’s the color of life and of death. Blood is Red. If you’ve seen Steven Spielberg’s film ‘Schindler’s List’, you will remember the girl in the Red coat. A film almost entirely shot in B&W except for that splash of red color. 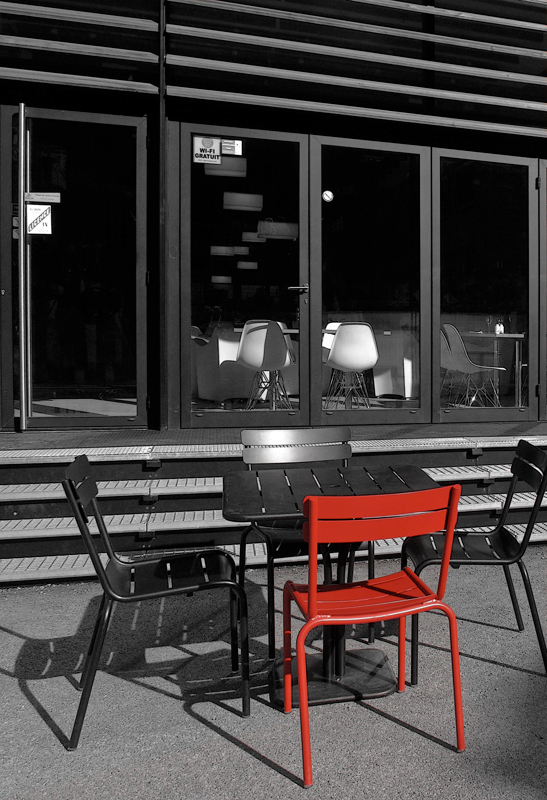 Occasionally I find an image where I can exploit the color Red, by de-saturating the image of all other colors – except Red. You might have seen my previous post ‘Red Asters’ on this topic. I’ve yet to find an image where any of the other primary colors can be treated so effectively in a similar way. But maybe I just haven’t found the right image yet. Here are a few examples where I think this process has worked for me. This first image needed minimal adjustment to get rid of a trace of blue (far left), and in fact I have cheated slightly by not de-saturating yellow completely. This was taken on the long walk to the NEC, Birmingham from the Railway Station for the annual Focus on Imaging Exhibition last Spring. I would guess 50% of the people who walked by must have been on their way to the Imaging Exhibition and I was amazed I was the only one who saw the possibilities. Eyes open, people! 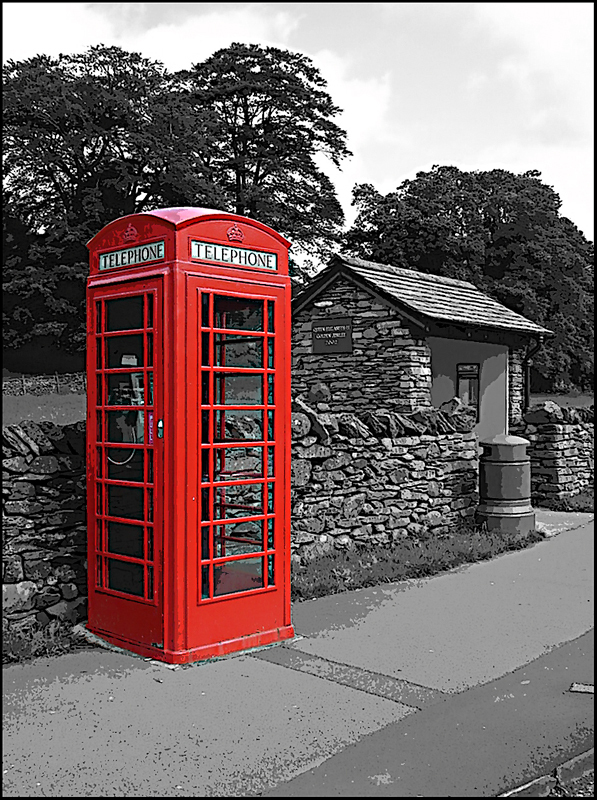 Next an English Icon – the public telephone box. This used to be a fixture in every town and village, but now these are largely obsolete and most have been removed. At the Aiguille du Midi lift in Chamonix, I found a clutch of chairs, and only one was actually Red. Staying in Chamonix, an image from high above the town on the Brevant ski area. 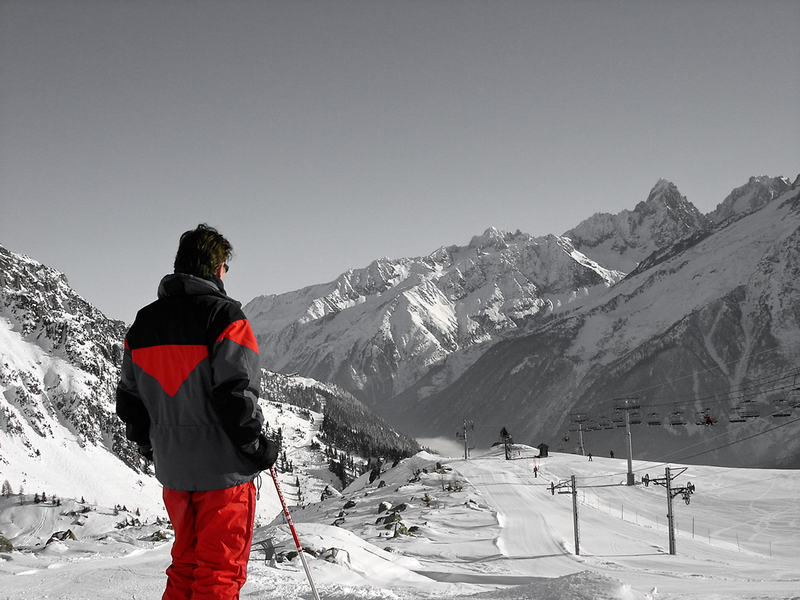 Ski Instructors tend to wear Red. It’s the best color to wear if you ever need finding. 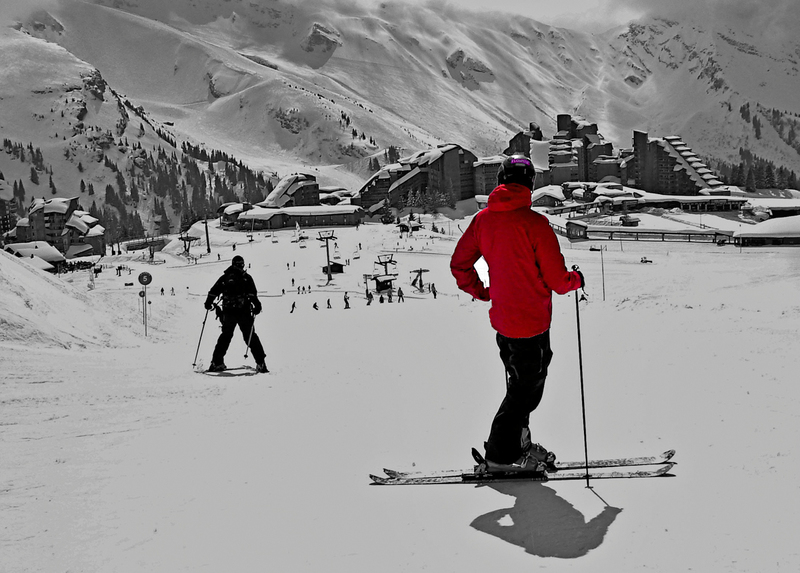 Continuing the ski theme, heading down into Avoriaz in the Portes du Soleil ski area. 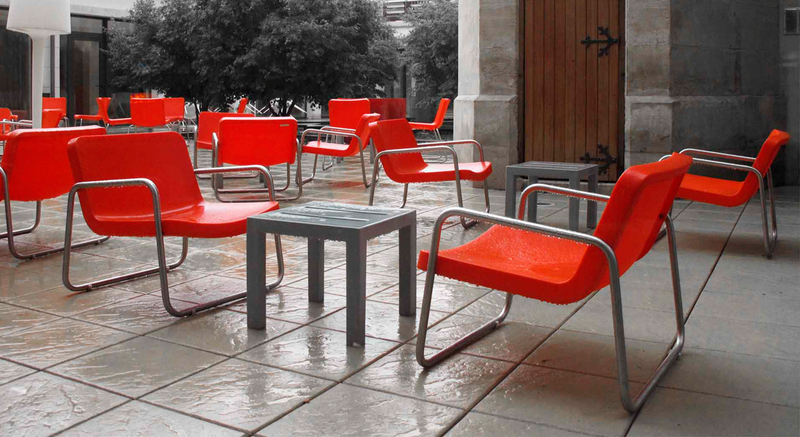 A wet day in Reims on our way to the Alps, and the chairs in the hotel’s courtyard had no takers. I deliberately left a trace of color in the paving slabs and the door – removing those tints made the scene look too stark. 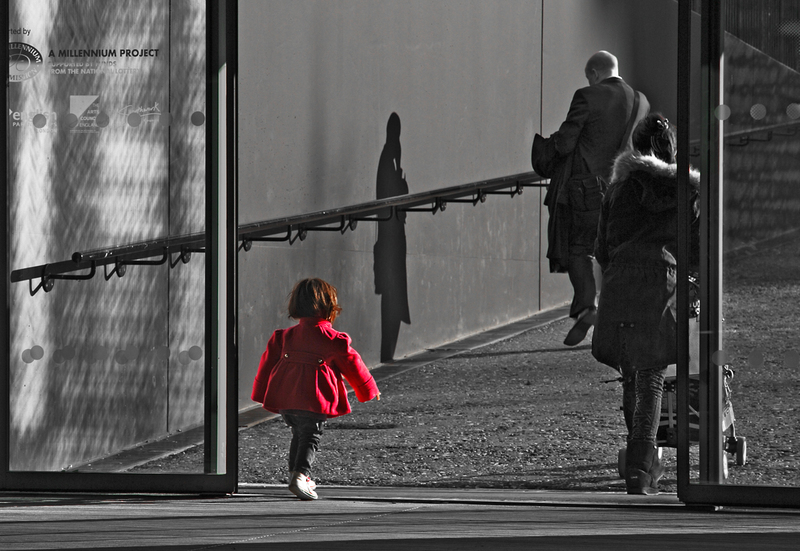 Finally I had to include this one of a little girl in a Red coat. If you’ve never tried this technique – hopefully I’ve inspired you to give it a try. This entry was posted in Derivative and tagged De-saturating images, Red. Bookmark the permalink. Selective color focus can be a really powerful technique. I really like the smooth transition of color to desaturation in the first shot. Well done on the selective color. You really put some work in to this buddy, I can tell. Nice job. Now this is just awesome Andy! What a great collection of shots, and as red is my favorite color, I’m a huge fan! Great way to use selective color Andy. Red is indeed a great color although it can be blown out in today’s cameras. You’ve done a great job in processing to prevent that. 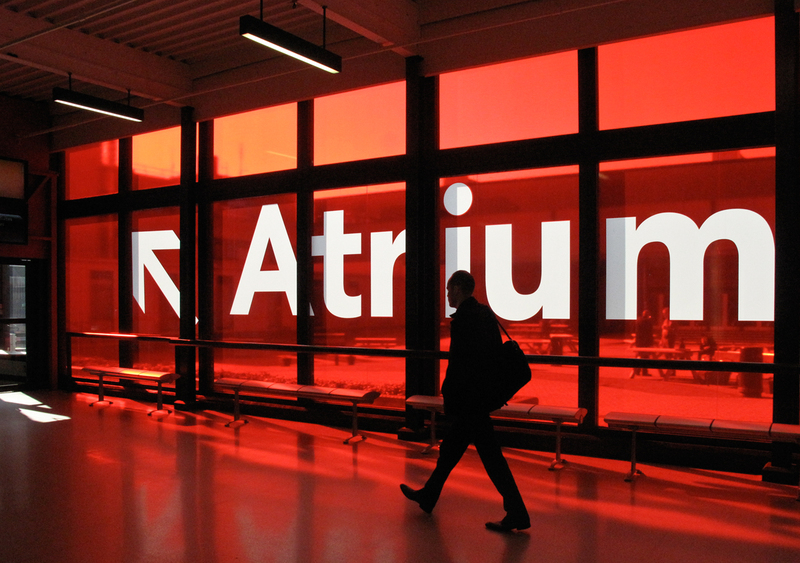 I love the selective use of red. One of my favorite ways to draw attention to a subject. What a great, great post! Very dramatic and emotional! Great work, Andy, truly a gem my friend.